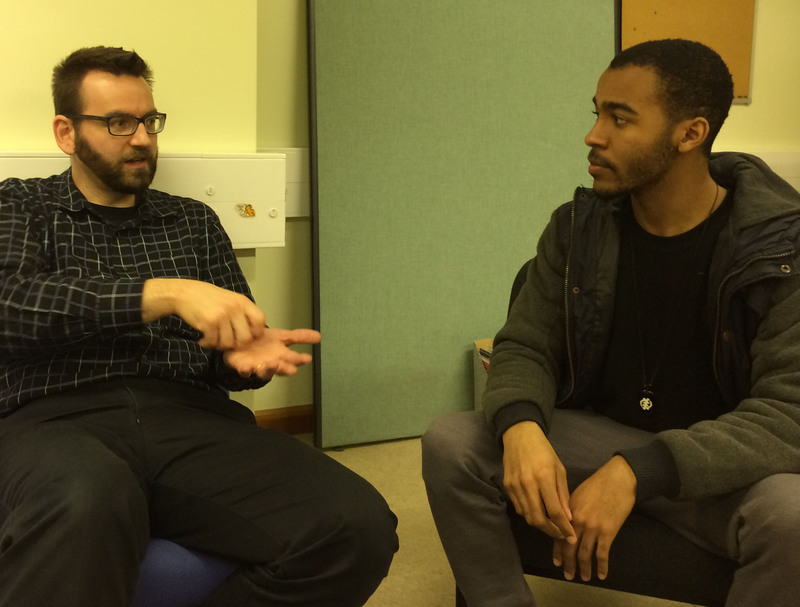 Last week, BdB looked deeper into issues around colour and accessibility with visiting speaker Dr David Flatla. David is a Lecturer and founding director of the Digitally-Augmented Perception Research Lab (DAPRlab) at the University of Dundee. DAPRlab seeks to digitally enhance the perceptual abilities of people with both atypical and typical sensory abilities. David’s particular research interests lie in developing personalised models and new assistive technology to help people with impaired colour vision. His previous work has received Best Paper awards from CHI and ASSETS, and he received a Canadian Governor General’s Gold Medal for his PhD research. David described his involvement with recent bottom-up (assistive tech) and top-down (designers) approaches to addressing challenges for users with different kinds of impaired colour vision (ICV – more commonly known as colourblindness). Colour vision is a vital component of everyday living and its loss can severely limit a person’s livelihood, threaten health and safety, make food preparation difficult, and even challenge someone’s social acceptability. In spite of these complications, visual designs that employ inaccessible colour choices abound, and people who experience impaired colour vision have little assistive technology to help overcome these challenges. Typography undergraduate Ryzard Akita is designing a prototype for a food app for users with visual-impairments as part of his final year self-directed project. Ryzard said: “David’s talk on colour accessibility was very insightful. He highlighted the importance of understanding inclusive design and discussed how individuals live with ICV on a daily basis. Unfortunately, colour accessibility is something that is often overlooked in the design industry. So to counter this David encourages designers not be one minded and has suggested tools available to aid the inclusive design process. David’s visit was hosted by BdB team member Faustina Hwang and the School of Systems Engineering. Our BdB team look forward to hosting more seminars with cross-disciplinary relevance. This month, our Built Environment students learnt about the importance of prioritising inclusive design through simulation. 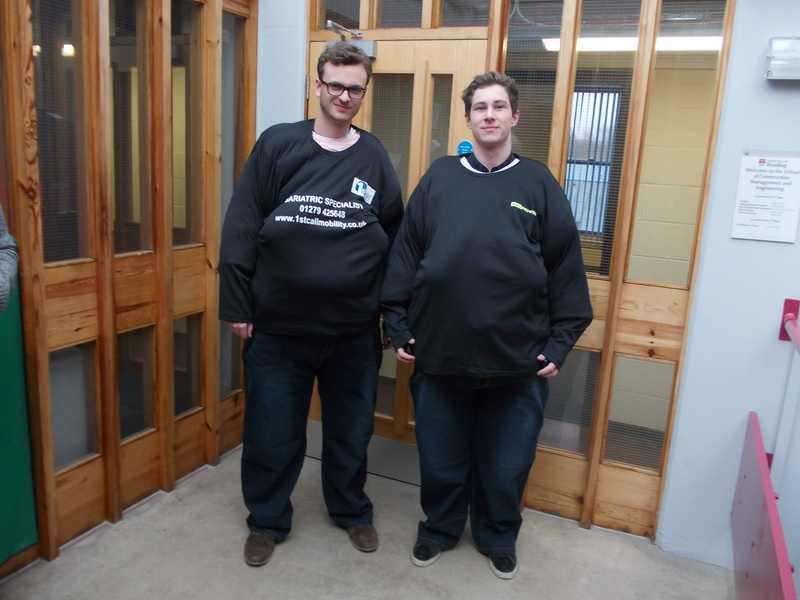 Using specialised equipment such as bariatric suits, simulation gloves and wheelchairs to simulate different conditions, students gained insight into the kinds of everyday difficulties that people with various disabilities are likely to experience when using a building. The students undertook a number of everyday tasks such as walking up and down stairs, and using a lift and toilet facilities. 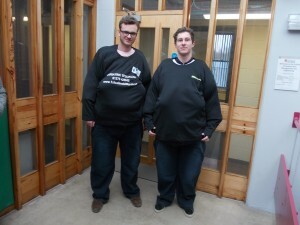 Wearing bariatric suits, students first experienced the challenges of using small spaces such as lifts and toilet facilities. Some of the lifts in the building used in the exercise were fairly small, leaving little room for personal space once two people had entered the lift. Similarly, there was little room to manoeuvre inside the gent’s toilet cubicle, making entering and leaving difficult, and sitting down extremely cramped. Students experienced how the width of the cubicle was inadequate for a person with a large build, with almost no room to move their arms when sitting. 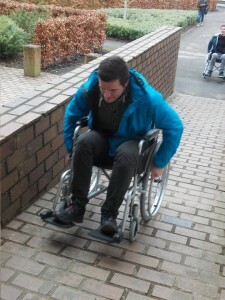 Using wheelchairs with large wheels that can be propelled by the user, students experienced difficulties with using lifts and other means of access. In particular, they discovered that one of the ramps up to the URS Building is very steep, which meant that it was a quick ride down, but required some expenditure of energy to get back up the slope again. They noted that the wheelchair seemed unstable going up the ramp, unless the user bent forward in the chair. Leaning back in the chair and pushing the wheels resulted in the front lifting up. The students also attempted to move across a gravel bed, which proved quite difficult. The final task for the wheelchair user was to experience using one of the disabled WCs in the URS building. 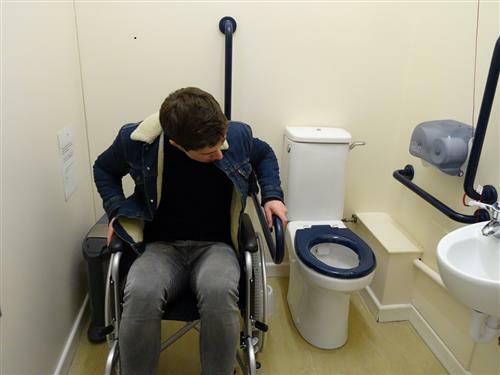 This proved to be quite a challenge, as there did not appear to be any simple way of moving from the wheelchair onto the loo itself. Although there are rails that can be used to hold onto whilst moving out of the wheelchair, the rail on the left (nearest to the wheelchair user here) seemed to be more of a barrier, rather than an aid. One student almost managed the task, but only by literally lifting him up and over the rail. This was an enlightening experience into the difficulties faced by wheelchair users, and also by the designers of accessible WCs. 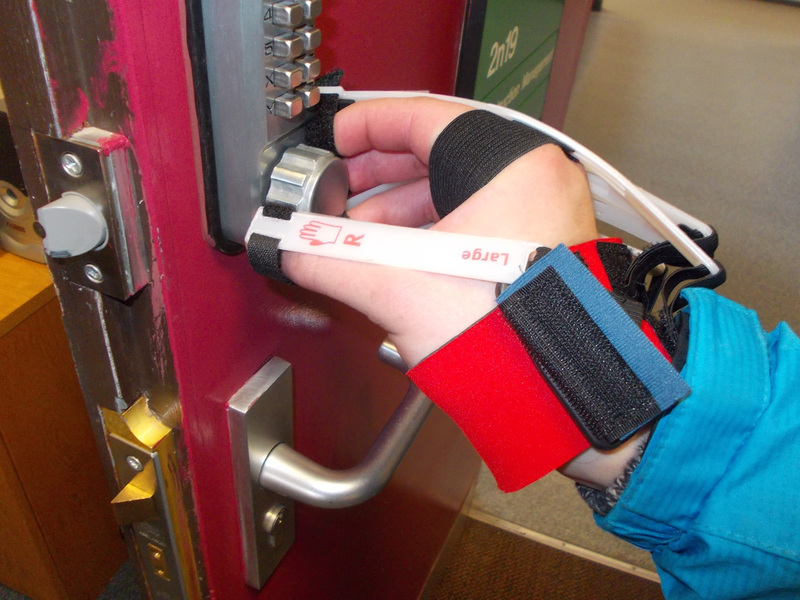 The final task for students was to wear simulation gloves while performing everyday tasks, such as using a mobile phone, a laptop, or just using the handle on a door. The plastic strips on the gloves reduces the amount of strength and control that you can apply when undertaking a simple task like this, making gripping the object more difficult. Geoff Cook and Christina Duckett led the workshop, with assistance from our new team member Nic Hollinworth (who also wrote this blog). 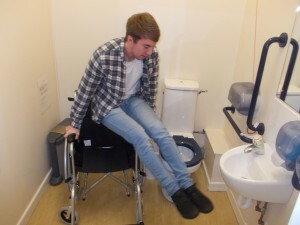 SCME Students get to grips with the reality of ‘wheelchair-accessible’ wcs in tutorials! it’s not as easy as they thought! creating awareness of the needs and preferences of users with limited dexterity. 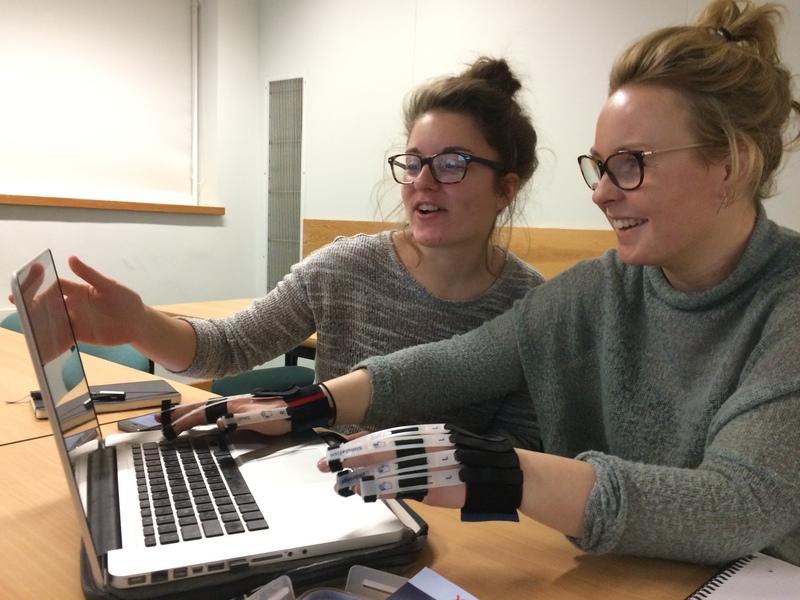 In the dexterity sessions, students wore simulation gloves to experience how conditions like arthritis affect how users can interact with digital devices (e.g. laptops and mobile phones) and paper artefacts. Working in pairs, they recorded and shared each other’s observations and interactions on a group discussion board in Blackboard. Laptop interactions: Students noted how the gloves made them aware of how difficult, slow and uncomfortable it was to type on their laptop given that they could not bend their fingers as much as they usually do. They also highlighted that it was extremely difficult to scroll and use the trackpad on their laptops for navigation and doing Mac-based interactions like zooming in and out. Most of them said that clicking was ‘okay’ but noted that it could be difficult to select the right thing on screen and know for sure if they had activated it. Mobile interactions: With their mobile phones, the students experimented with things they do every day from typing to games. They were particularly surprised at how difficult it was to pick up and grip the phone. Instead of using their thumbs for many actions, they had to use their index fingers. They also found it hard to swipe and had to rely on tap gestures to interact with apps. Some buttons became inaccessible. For example, they noted that they had to use a different button in order to be able to take a selfie and that it was difficult to access the phone’s on/off button. Grainy and matt paper stocks are easier to turn and handle than glossy stocks or print finishes. These two workshops embedded inclusive design into yet another BA Graphic Communication module – Integrated Design Methods 2B (TY2INTB). Building on the workshops we held in Design Thinking (TY2DT) last term, our second year typography students have been introduced to a range of inclusive design considerations. 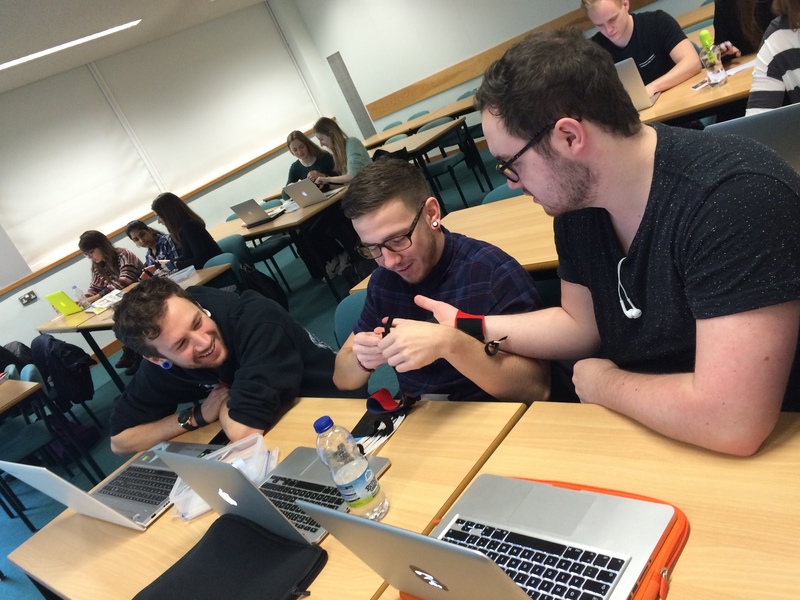 They are now working on applying their knowledge to their design of mobile apps for tablet and mobile phone devices in their practical module Integrated Design Methods 2A (TY2INTA). One student, Alice Watkins, has decided to design her recipe app especially for users with visual impairments. 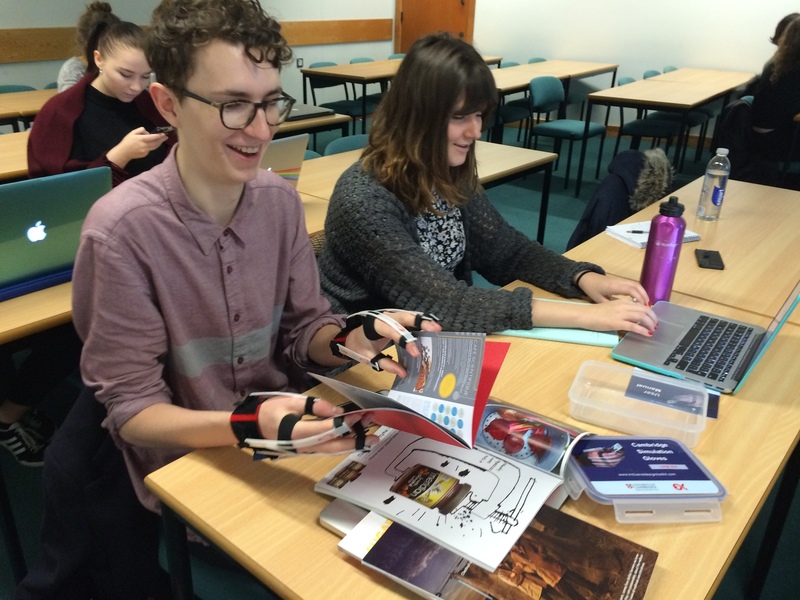 From a T&L perspective, using simulation gloves to interact with everyday objects provided students with a fun opportunity for task-based learning. Jeanne-Louise reported that it was particularly rewarding to observe how much the students learnt through their own discovery and how this enabled them to reflect on their design practice.